The Fun Of Beaujolais Nouveau! The release of Beaujolais Nouveau on the third Thursday of November has become a worldwide event. People eagerly await the new wine; from France to Japan, and all places in between. But what does it really mean for wine lovers? Is it the arrival of a great wine? Is it a gimmick? Is it a promise. Whatever your thoughts on this, it is an ingenious marketing ploy! Why a promise? Well, Beaujolais Nouveau is very young wine. Not so long ago, only a few weeks actually, the grape was still on the vine! Now it is on a retail shelf! By wine standards, to call this a young wine is an understatement. Many argue that despite its youth, the wine tell us something about the vintage this particular year. Was it a good year for Gamay grapes? 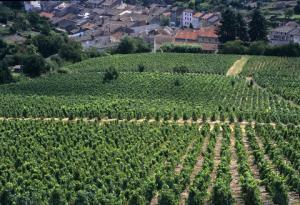 Will it be a good year for Beaujolais? The regular kind, that lovely wine with its fruity notes and charming ways. So What Are Its Characteristics? Beaujolais Nouveau is made from the Gamay grape in Beaujolais, France. The grapes are hand picked, and quickly fermented using carbonic maceration. This means that the grapes are not crushed, they are kept whole throughout the process. From harvest to fermentation to "aging" to retailing, it takes a mere six to eight weeks! The wine is light and fresh, with very little in the way of tannins. The wine is consumed between November and May, no later than 6 months after its release. Traditionally the region of Beaujolais made and consumed a young wine in celebration of the harvest. Sometime after World War II a day in November was set for its release; now being the third Thursday in November. Some enterprising wine makers and distributors saw this as an opportunity for a marketing campaign. The idea was simple and brilliant. Make a big deal of the wine's release, and watch the money roll in. They created a race to get the first bottles to Paris, from there the idea grew to race the wine to various countries. Now there are events in cities and towns, not just in France, but around the world. From Paris to Singapore to San Francisco! So the question again, is the wine any good? Is it an indicator of how good Beaujolais of that vintage year will be? Is it a gimmick? I am not sure if the wine will tell us anything about this vintage year, but I'll buy a bottle and toast to the harvest. Maybe I won't be at the wine shop at 12:01 A.M. on Thursday morning (The actual time of its release); nevertheless, gimmick or not, it's still great fun! Toast To The Harvest With Beaujolais Nouveau!